In cryptography, a cipher (or cypher) is an algorithm for performing encryption or decryption—a series of well-defined steps that can be followed as a procedure. An alternative, less common term is encipherment. To encipher or encode is to convert information into cipher or code. In common parlance, 'cipher' is synonymous with 'code', as they are both a set of steps that encrypt a message; however, the concepts are distinct in cryptography, especially classical cryptography. The word "cipher" (minority spelling "cypher") in former times meant "zero" and had the same origin: Middle French as cifre and Medieval Latin as cifra, from the Arabic صفر ṣifr = zero (see Zero—Etymology). "Cipher" was later used for any decimal digit, even any number. 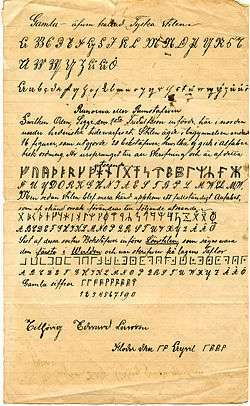 There are many theories about how the word "cipher" may have come to mean "encoding". In fact the more ancient source of word "Cypher" is the ancient Hebrew; there are more than 100 verses in the Hebrew Bible - Torah using word "Cepher": means (Book or Story telling),and in some of them the word "Cipher" literally means (Counting)-- (Numerical description)-- Example, Book 2 Samuel 24:10, Isaiah 33:18, and Jeremiah 52:25. The Serbians use the word "cifra", which refers to a digit, or in some cases, any number. Besides "cifra", they use word "broj" for a number. The Swedes use the word "siffra" which refers to a digit and "nummer" to refer to a combination of "siffror". As the decimal zero and its new mathematics spread from the Arabic world to Europe in the Middle Ages, words derived from ṣifr and zephyrus came to refer to calculation, as well as to privileged knowledge and secret codes. According to Ifrah, "in thirteenth-century Paris, a 'worthless fellow' was called a '... cifre en algorisme', i.e., an 'arithmetical nothing'." Cipher was the European pronunciation of sifr, and cipher came to mean a message or communication not easily understood. Another example is given by whole words cipher s, which allow the user to replace an entire word with a symbol or character, much like the way Japanese utilize Kanji (Japanese) characters to supplement their language. ex "The quick brown fox jumps over the lazy dog" becomes "The quick brown 狐 jumps 过 the lazy 狗". Key size, i.e., the size of key used to encrypt a message. As the key size increases, so does the complexity of exhaustive search to the point where it becomes impracticable to crack encryption directly. ↑ Ibrahim A. Al-Kadi, "Cryptography and Data Security: Cryptographic Properties of Arabic", proceedings of the Third Saudi Engineering Conference. Riyadh, Saudi Arabia: Nov 24-27, Vol 2:910-921., 1991. ↑ Ifrah, Georges (2000). The Universal History of Numbers: From Prehistory to the Invention of the Computer. Wiley. ISBN 0-471-39340-1.